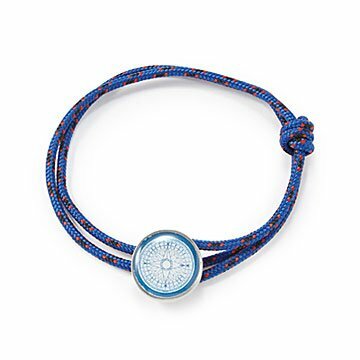 Charlotte Guptill's compass bracelet will inspire travelers and those who chart their own course. The 32 points of an antique compass rose, overlapping like flower petals, represent the directional winds that billowed the sails of long ago sea vessels. A reminder of your internal compass and the need to heed the changing winds, Charlotte Guptill's evocative pewter version fills your sails with inspiration as you navigate your course. (It also looks pretty nifty when you're relaxing with your crew.) Inspired by the cording of neatly secured cargo upon the top deck at sea, the adjustable blue nylon maritime tie-down cord enables you to wrap and wear the bracelet multiple ways, all of them comfortable. Handmade in Maine. NOTE: This compass rose, while beautiful, will not help you find your way home from a tiny Pacific island. If functioning compass jewelry floats your boat, navigate to our Compass Necklace and Hand Engraved Compass Necklaces.. I didn't give it to the intended person because I was so disappointed in it.